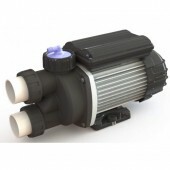 Today’s multi jet spa baths require a spa bath pump with high flow performance but quiet operation. Edgetec's Triflo Spa Bath Pumps have achieved both these features. The TriFlo has a patented twin and single outlet flow path which allows the TriFlo to deliver the water required to today’s multi jetted spa baths ensuring user satisfaction. At Pool Supermarket, we have a range of options for you to choose from, each providing a range of features to suit your personal requirements.